As I have mentioned before, sartorial matters have not always been my specialty. I am embarrassed to admit that there was a time when I shied away from purchasing any clothing that could not be handled by a normal cycle in the washing machine and tumble dried low, because I was too intimidated by the alternative. Even more embarrassingly, there was at least one year in which I did not wash my bras at all, because I wasn’t sure how and was afraid of damaging them. Enter the drying rack. Once I purchased one, I felt I could tackle washing delicates and other finicky clothing items with confidence! Delicate cycle. Gentle soap (although from the reviews, it looks like the formula was recently changed. I may have to search for an alternative…). Lay the items out to air dry. No problem! Except, there was a problem: My drying rack took up a huge amount of space. It was two large mesh squares with plastic frames, which stacked. In theory, removing the plastic feet would allow one to stack the racks flat, but popping the feet off was a pain, and even then, the large mesh squares remained. They didn’t fit in the laundry room or a closet, so were often awkwardly stowed behind a chair. When in use, they took up valuable floor space. 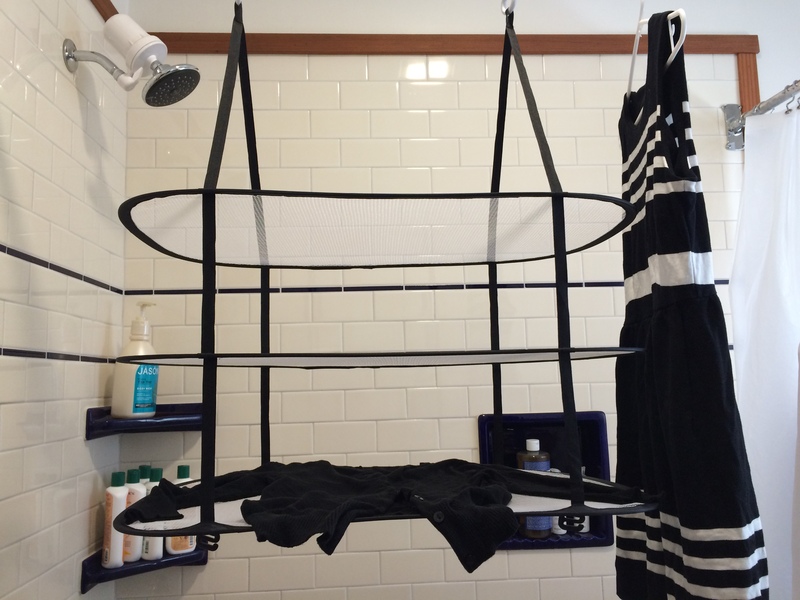 Last month I decided I had had enough of dragging these squares around the house, did some research, and found this lovely hanging drying rack. It easily collapses to store completely flat, does its job out of the way of traffic, comes with a complimentary lingerie bag (something I have yet to fully embrace), and costs less than $10! What a revelation! How about you? What is your delicates laundry routine? Any new game changing items in your life?